This eBook is no longer available for sale. In this age of superstring theories and Big Bang cosmology, we're used to thinking of the unknown as impossibly distant from our everyday lives. But in A Different Universe, Nobel Laureate Robert Laughlin argues that the scientific frontier is right under our fingers. Instead of looking for ultimate theories, Laughlin considers the world of emergent properties-meaning the properties, such as the hardness and shape of a crystal, that result from the organization of large numbers of atoms. Laughlin shows us how the most fundamental laws of physics are in fact emergent. 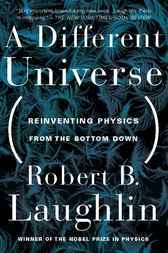 A Different Universe is a truly mind-bending book that shows us why everything we think about fundamental physical laws needs to change. Robert Laughlin is the Robert M. and Anne Bass Professor of Physics at Stanford University, where he has taught since 1985. In 1998 he shared the Nobel Prize in Physics for his work on the fractional quantum Hall effect. He is a Fellow of the American Academy of Arts and Sciences, a Fellow of the American Association for the Advancement of Science, and a member of the National Academy of Sciences. He lives in Palo Alto, California.